Sunday offers us the opportunity to reflect on the Scriptures. What better way to prepare to hear the Word of God by reflecting on the Gospel. 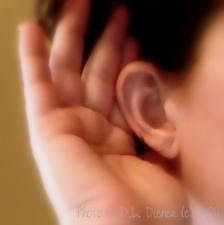 An attentive listening to the Good News, to the voice of God spoken to us, is what Jesus had in mind when he often enough asks us, "Do you have ears to hear, and fail to listen?" Paying attention to God's voice, really listening to what is being said, is difficult when our ears and minds are cluttered with the honks and hoots, the toots and beauty and the bothers of life. Who has the time or the tools to calm the sounds inside and outside our heads, to quiet the muddle of our thoughts and of life to say to God: Here I am, I am listening? These seven simple words of prayer, "Speak, Lord, for your servant is listening." It's a request that God help you to hear what he has to say -- hear his still, small voice among the many other competing voices in a sound-saturated society. It's a conscious and concerted effort to tune out the distracting babble of billions of fellow beings, and tune in the divine bandwidth of Almighty God. It's a prayer that you will be able to listen to the Lord and determine together what he is calling you to do and to be today. Virtually everybody and anybody can hear God's voice, but few choose to listen. After all, who has the time? Who has the temperament? Who has the tools?